Pixelwix is an innovative media solutions provider. We tested many projectors but none had the quality and total cost of ownership mix the Optoma brand has. I look forward to working with Optoma on future projects even bigger and more complex. Challenge: Design an 8 foot tall, 360 degree Projection screen for T.J. Wilcox’ work “In The Air” exhibit for the Whitney Museum in NYC. Solution: Brackenbury used ten Optoma W306ST projectors for their unsurpassed short throw performance and intense immersive viewing capabilities. Results: "In the Air" premiered to rave reviews as a dazzling, one of a kind, panoramic projection exhibit. Pixelwix, an innovative media solutions provider, knows how to take art to the next level. Pixelwix warp and blend software gives multiple Optoma projectors the ability to be blended and displayed as one large mega pixel screen. This is exactly the type of display technology that avant-garde artists are looking for to exhibit their work as an immersive cinematic experience. The challenge for Pixelwix was how to display a work of art to be featured on an 8 foot high circular screen, hanging 4 feet off the floor in which museum goers could enter into and submerse themselves in the art without the use of a door? Light levels had to be 100% with absolutely no picture distortions. 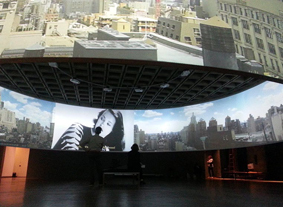 Ten projectors would need to be displayed at precise space intervals around the panoramic screen display. Pixelwix experimented with other manufacturer’s projectors and which proved problematic. They were either too expensive, produced too much light or ran too hot for continual play. The cost of replacing lamps regularly would fall to the museum which housed the art. None were acceptable solutions. Enter the W306ST, a short throw projection powerhouse from Optoma. The installation required a projector with exceptional colour reproduction from a short projection distance and advanced energy features to reduce the cost of the production. And, because the W306ST is easy to operate and maintain, they could walk away from the installation knowing the museum staff was capable of monitoring the ongoing display.